Guest Post by Julia Reich of Stone Soup Creative. If you know anything about me, you know that whenever I am not working, I am outdoors – hiking, biking, skiing, paddling, camping, taking long walks with the dogs (my self-proclaimed motto is “I brake for trailheads”). So it goes without saying that when I moved to Indiana about six months ago, almost every weekend I enthusiastically began exploring parks and other natural areas around my new home state. 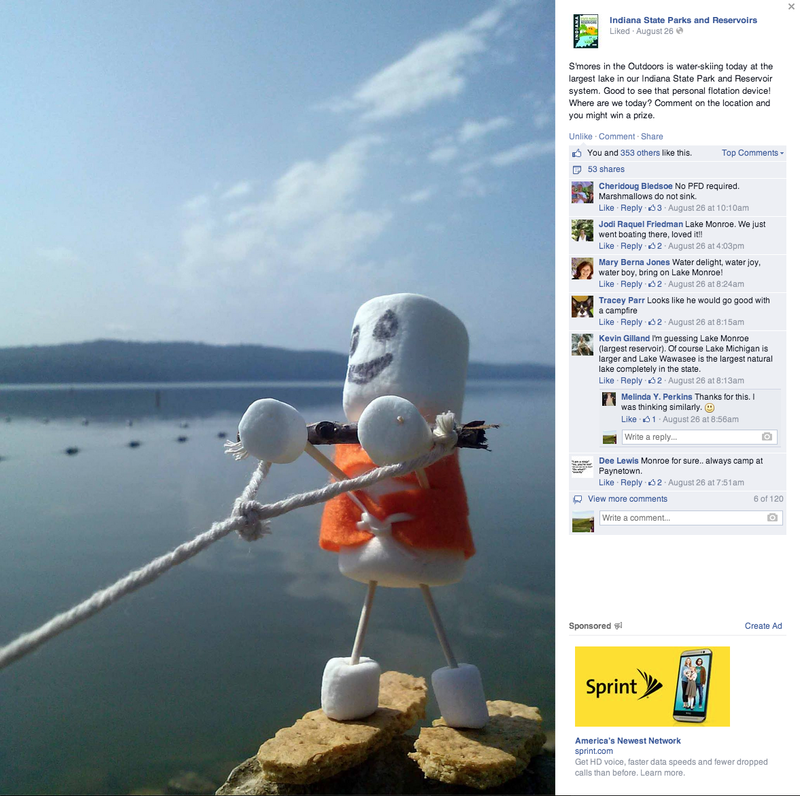 Early in August I started noticing some really fun images of marshmallows in various parks, dressed up and posed like people, showing up in my Facebook feed from the Indiana State Parks and Reservoirs page, whom I follow. They appealed to me, so I started to pay attention, and was rewarded with a new surprising photo each day, along with stories and facts about each park, which I quickly shared on my Facebook page. The campaign has been very effective in inspiring me to learn more and to keep exploring their properties. Judging from the number of enthusiastic comments from followers, I figured it was a huge success and decided to seek further information. Following is an interview with Ginger Murphy, Deputy Director for Stewardship for Indiana State Parks and Reservoirs. Thank you, Ginger for your willingness to share the details of the campaign with my readers! 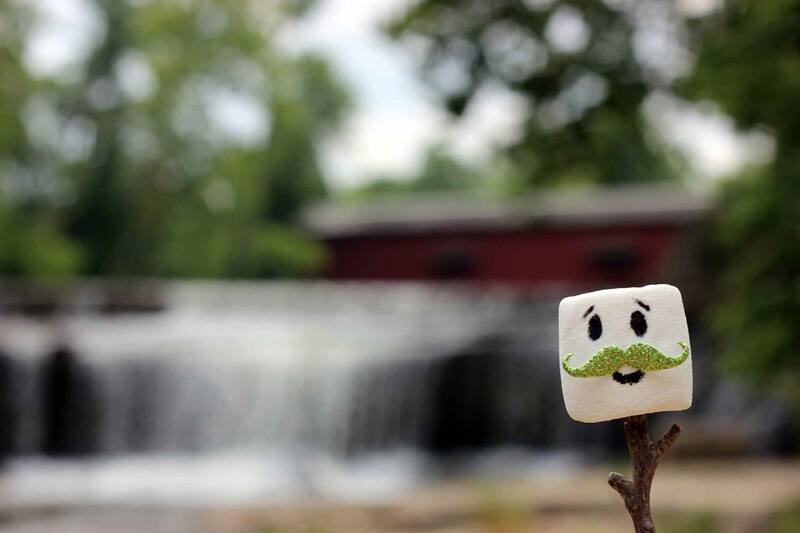 Q: The whole awareness campaign is very clever – from the name (‘S’mores in the Outdoors’) to the execution – photos tableaus of marshmallows dressed and “made up” as characters, set in a variety of park landscapes (sometimes graham crackers and chocolate make it into the shot, too). The posts ask people to guess where the S’mores are posing, and later, comments provide answers and historical facts. How did the idea develop? A: Brad Bumgardner, our interpretive naturalist at Indiana Dunes State Park and one of our most savvy social media users, first noticed something similar with marshmallows on the South Dakota State Parks page. We modified it to focus on s’mores, which are a popular camping treat, condensed the promotion into the month of August to jive with National S’mores Day [ed. note: National S’mores Day, an “unofficial” national holiday, is sponsored by the National Confectioners Association.] on August 10th and asked our interpretive naturalists to be creative and come up with s’mores visiting iconic features or doing things visitors really enjoyed in their home state park or reservoir. Q: Were you actively seeking ideas for a campaign to bring more awareness and education to the properties around the state that you manage? A: We are always looking for good ways to introduce people to the outdoors in general and to the natural/cultural resources and recreation opportunities in our state parks and reservoirs specifically. Q: Were you specifically looking for a social media strategy? A: Our goal with the use of social media is to engage visitors in conversation about our properties, share events and features they might be interested in but don’t know about and link them to our DNR webpage where they can find out more about a specific site, project or program that we feature in the social media post or tweet. Q: How and when was the campaign launched? How and when will it conclude? A: It was launched on the Friday before National S’mores Day, and will end on August 31. Q: Besides the daily photos on Facebook, from what I could tell there was also a contest and a hashtag. Can you explain all the facets of the campaign? A: During the weekend of National S’Mores Day (August 8-10) we invited people to post selfies with friends and family eating s’mores they’d made in a state park or reservoir. We awarded three prizes randomly among those who posted images. 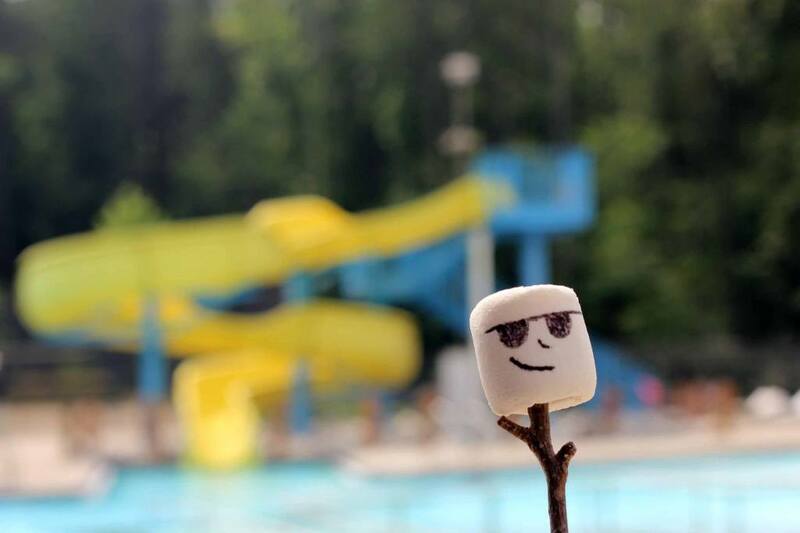 Q: You mention prizes were awarded – this was for the S’mores selfies, and for readers guessing the park locations in the photos correctly, right? Were there any other contests? Q: Was a significant part of the campaign focused on Twitter, Instagram, Pinterest or other social media outlets, too? Q: What department was tasked with initiating and executing the idea? How many people were involved? A: The Division of State Parks and Reservoirs managed the campaign with approval from our Division of Communications. One individual (me) managed all the posts, and photos were sent from individual properties. Photos were provided from about 15 different DNR staffers, and one of our administrative staff will handle mailing out the prizes. Q: Did anything about the campaign change from your original plan during the weeks it was executed? A: No, it all was handled as planned. Q: What were your goals and objectives for the campaign? Celebrate National S’mores Day. S’mores are an iconic tradition for anyone who camps, and enjoying them reinforces the universal concept of relaxation around a campfire with family and friends. Promote the s’more-making programs that are happening August 8-10 at 8 of our properties as part of National S’mores Day festivities. Promote camping at our properties as an outdoor activity; people will need to indicate where they are camping in their photos posted and we will provide links to those property pages, and provide links to camp.in.gov and notes about where we still have sites available. We can also provide recipe suggestions. Promote iconic and little-known features and natural/cultural resources and things to do at our properties. We will indicate in the rules that photos become property of DNR. Q: Would you consider it a success? Has it had the impact you expected? Q: How are you measuring impact? A: Likes, comments, shares by monitoring Facebook insights. Q: Was there one photo that was clearly everyone’s favorite / the most successful? Why? 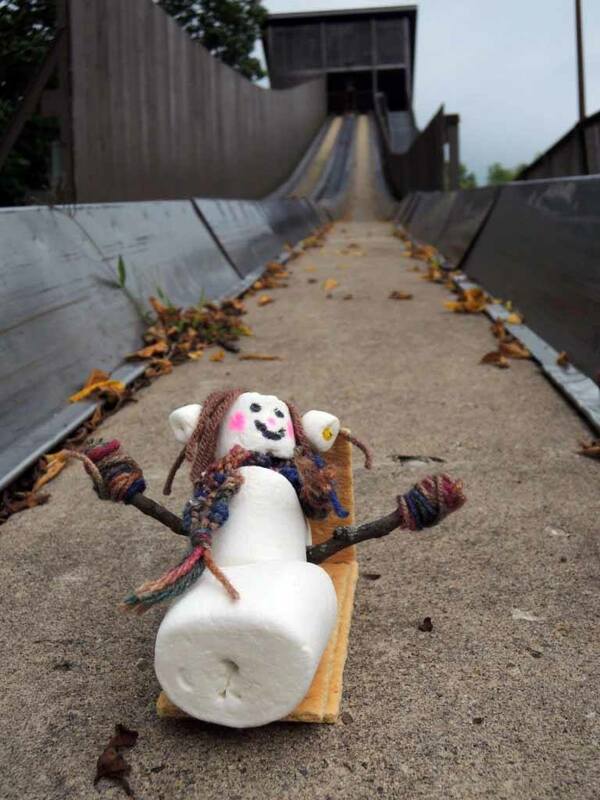 A: So far, a photo of a s’more on the refrigerated toboggan at Pokagon State Park has been one of the most popular; it is a well-known park feature that many people have memories of riding at some point in their lives. A photo of Cataract Falls and the covered bridge located just beyond the falls was surprisingly popular – again I believe it is because people have great memories of that location. Q: Do you have any suggestions for other agencies/organizations who are interested in launching a social media awareness campaign – tips, or things you’ve learned along the way? A: People love scenic photos of park features – sunsets, waterfalls, historic buildings. They enjoy photos of and information (brief with links) wildlife. They appreciate receiving alerts and updates/notices about things that are changing at a moment’s notice, such as a beach closure due to flooding or a road closure for construction on the way to their favorite state park. They seem to enjoy contests that allow them to guess where the photo was taken, and I am always a little surprised at and appreciative of how many people know so much about our state parks! Finally, they really seem to like “looking back” at old photos of people and facilities in parks years ago. 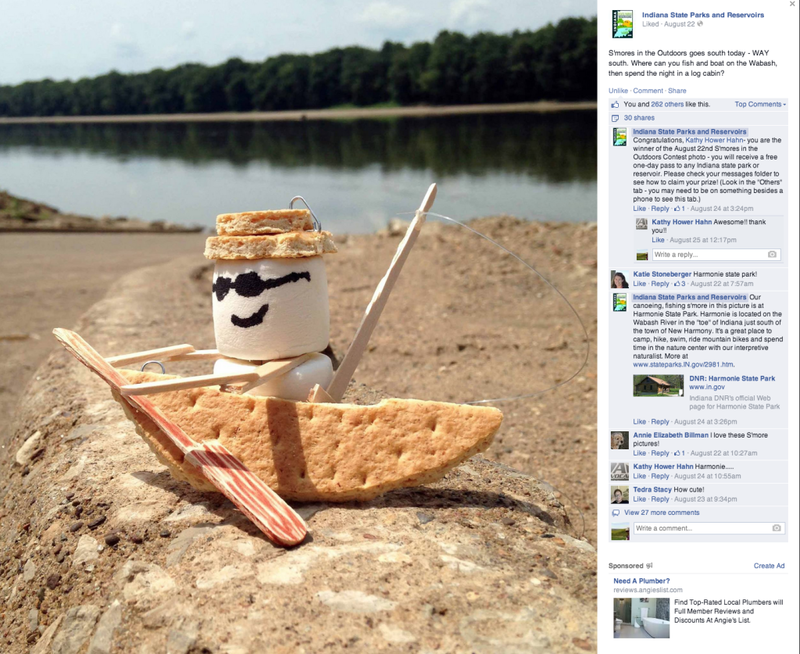 Q: Is there anything else you’d like to tell readers about S’mores in the Outdoors? A: Anyone who missed S’mores in the Outdoors will be able to see all the pictures in an album on Facebook in a few days, and they’ll be posted on the DNR website as well. We use our social media to inform, interpret and link to places where visitors can get more information. Our state park system will be 100 years old in 2016 and we like to say that our state parks are places where nature brings families together and traditions are born. In many ways social media is one of the first elements of a visitor’s experience at a state park, and warm, welcoming experiences are what bring people back again and again, generation after generation. Thanks for your interest in what we’ve been doing, and thanks for helping to promote it! Julia Reich combines a strong design, business and leadership background as Principal of Stone Soup Creative (formerly Julia Reich Design). She oversees the firm’s creative studio on a variety of innovative branding, marketing and design projects for nonprofits, foundations and educational institutions. Julia has also been featured in several design books including Graphic Recycling and The Big Book of Green Design. Learn more about her and the studio at Stone Soup Creative, Facebook, and Pinterest. You can also follow her on Twitter @juliareich. PreviousPrevious post:A Lesson on Listening… and Making More Money with Your NewsletterNextNext post:Nonprofit Marketing Team Roles and Tasks – Who Does What?